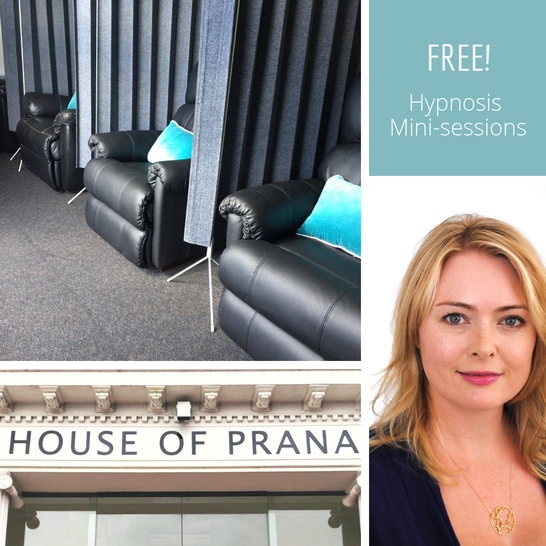 Awaken Hypnosis Launceston is celebrating with free mini-Hypnosis sessions for everyone! The iconic space I work from, once built as a Roman Baths, is undergoing a facelift and a revamp. Now the House of Prana, it will include a greater range of wellness services. To celebrate, we are offering lots of free services (including Hypnosis) this Sunday. Just for this Sunday, I will be running Hypnosis sessions on the ground floor of the building (normally I use the beautiful wellness centre on the first floor). Just drop in and you'll have the opportunity to chat with me about Hypnosis, and try out the amazing sound and light technology I use to ensure you can enjoy the Hypnotic experience. You'll also have a range of Hypnosis recordings to listen to as you relax. Sessions will be between 10am and 1pm. Massage - Relax and enjoy 5 minutes with Natalie from Body Maintenance Massage Studio. Acupuncture - Enjoy a Chinese Medicine diagnosis with Sarah George Acupuncture & Natural Health. Art based healing - Contribute a layer to a Community Mandala with Sarah from Soul Expressions SMP. Sound immersion - Lie, sit, move or dance in a sound immersion using drums, gongs and leather horns. Matthew, Lila and Kora will be holding the yoga room space for 2 hours from 1.30pm, feel free to come and go from the room. Take a tour, Be the first to see how Kate and Jenny from Liquid Zen have transformed hallways and unused rooms into a divine float therapy space. Curious? There will be information sessions throughout the day to answer all your questions. Place: House of Prana, 127 George St (formerly Bikram Yoga Launceston).